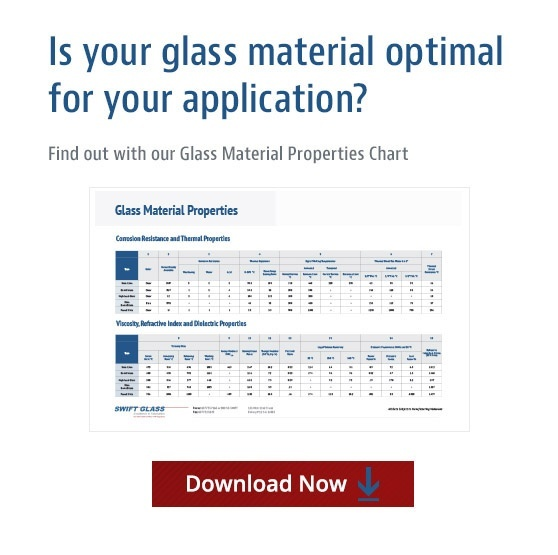 What If Your Glass Piece Requires an Irregular Shape? What happens when you need glass cut into something like the shape to the right? Precision glass manufacturers utilize a variety of technologies to craft even the strangest of shapes that require clean edges, precise spheres and smooth surfaces. The glass mirror piece in the photo to the right is one example. Precision manufacturers like Swift Glass utilize a variety of techniques to achieve difficult configurations like this one. The highly pressurized stream of water from a waterjet cutter provides an exceptionally smooth and controllable tool. These cutters can automatically switch from low to high pressure mode in the midst of a single tool path, allowing for specialized cuts at high speeds — even in the most brittle glass. Our waterjet cutters work with CAD compatible software, integrating drawings seamlessly and efficiently from original concept to final product. Our tools can cut virtually any shape down to 0.5mm thick, and can handle glass materials up to 9 inches thick. High pressure waterjet cutters create pinpoint accuracy smoothly cutting holes, notches and details without damage or distortion. Irregular shape water jet cutting works well for quartz, optical glass, fused silica, Borofloat®, Pyrex®, and many other specialty materials. Three- and four-axes diamond tooling technology allows manufacturers to cut the toughest materials, including quartz and high-pressure gauge glass. These glass milling solutions serve a range of industries, from optical and lighting to aerospace and energy. Many businesses require glass doors, mirrors, or furniture with functional or decorative holes. Glass manufacturers use high precision hole drilling to meet exact dimensions and specifications. Diamond-tipped drill bits have the ability to cut holes perfectly with very close tolerances, for materials up to 1.25 inches thick. 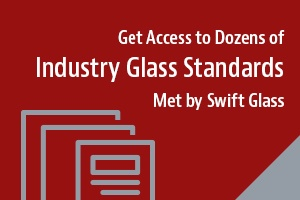 Swift Glass is one of the nation’s leading manufacturers of fabricated glass parts, including reliable cutting solutions for glass shapes of all kinds. With over two decades of experience in custom water jet cutting, we can confidently promise both versatility and precision for even the most intricate projects. Ornamental components, solar panels, gauges, wafers, and explosion-proof glass are all fabrication projects that the Swift Glass Team has handled for customers. Access our library of Standards and Specifications for more information about the requirements we can meet.